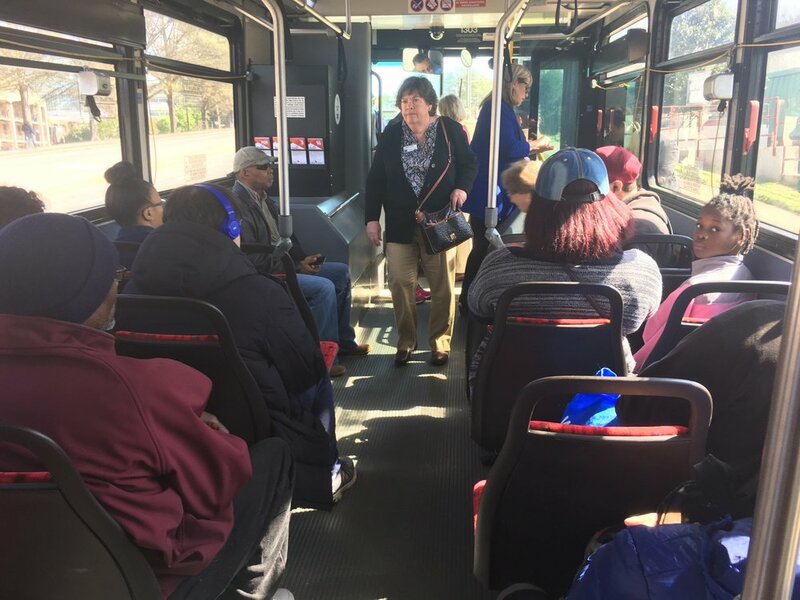 RALEIGH (APRIL 11, 2018) – With only two empty seats, the GoRaleigh bus pulls away from the stop on Avent Ferry Road and rolls toward N.C. State University on its way to the GoRaleigh Station downtown. Several riders – college students, a mother and child and a Starbucks worker among them — have scooched to make room for the newly boarded bunch from the League of Women Voters of Wake County. 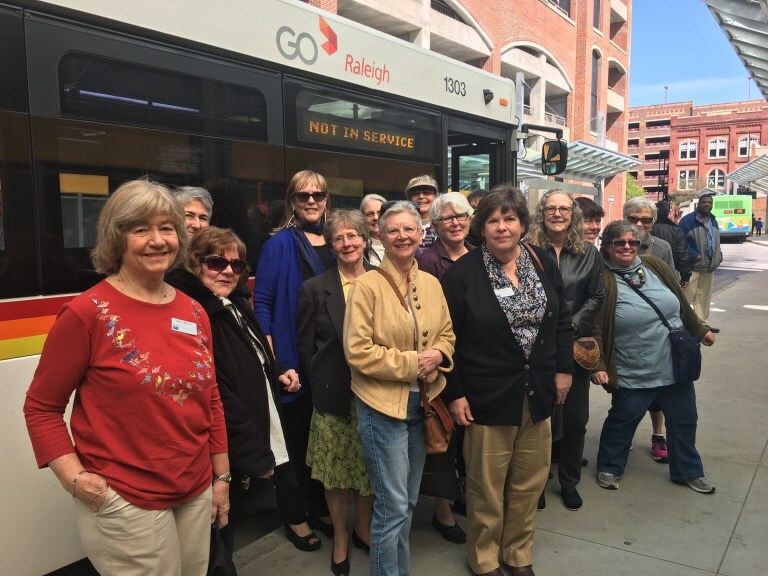 The 14 women are on a field trip of sorts, their goal being to learn how to use transit by meeting at Mission Valley Shopping Center and taking the Route 11 bus downtown for lunch. Eve is Eve Vitaglione, a lifelong transit user who took public buses to elementary school in New York. There were no school buses where she lived as a child. Before the bus even arrived at Stop 8566, the women already had learned something important about transit in the Triangle: They never have to wonder where a bus is as long as they have a phone. All GoRaleigh, GoCary, GoDurham and GoTriangle buses can be tracked in real time at triangle.transloc.com or by downloading the TransLoc app. Easier still is that each bus stop sign has a number to text to find out when the next bus will arrive. Chapter member Gina Boccetti drives 140 miles roundtrip twice a week from her home in Jones County to attend legislative committee meetings in Raleigh so she can stay informed. The downtown parking fees are a burden on top of the gas, she says, so she’s hoping to learn ways to take a bus. A single fare on a GoRaleigh bus is $1.25, but day, week and monthly passes are available at discounts. Even better for this group of retirees, people over age 65 ride free with a GoRaleigh ID card. On GoTriangle’s regional routes, seniors can ride for $1 with a valid ID. When the bus arrives at the GoRaleigh Station, the women step out into the newly renovated space with nods of approval then head immediately to the cashier to get themselves ID cards so their next Raleigh adventures will be free. Around Wake County are all sorts of events and festivals and breweries and restaurants the women hope to explore by bus. “I can take the bus downtown for things like Brewgaloo and all of the other festivals and not worry about driving snockered,” says Jackie Giordano, a professional organizer and retired educator, with a laugh. Vitaglione’s admiration for the station grows as she inspects the facilities. When the group’s lunch at a downtown restaurant winds down and the clock passes 12:30 p.m., decisions must be made. Route 11 runs every 30 minutes during peak hours but only hourly during midday, so missing the bus at 12:45 means waiting until 1:45 p.m. Many bus service expansions already have been made since Wake County voters approved a transit-designated sales tax to invest in the Wake Transit Plan in 2016. Among many other improvements, the plan calls for tripling bus service by 2027, and that includes adding frequency to popular routes as well as connecting all of the county’s communities. April 30, Town Hall (2nd Floor), 900 Seventh Ave., Garner. May 1, Cary Arts Center (Paul Cooper Room), 101 Dry Ave., Cary. May 3, GoRaleigh Operations Center, 4104 Poole Road, Raleigh. May 14, WakeMed Andrews Conference Center, 3024 New Bern Ave., Raleigh. Wake, Durham and Orange counties are working to go forward together to create a strong regional transit network. Voters in each county have approved transit-designated tax investments, and each county has a long-range transit plan that connected to the others’. As 12:40 approaches, Giordano and three other women hop up and scurry to the station to catch the next bus back to Avent Ferry Road. The rest of the party will wait for the 1:45 departure. Once the quartet is seated, two riders engage the women in friendly conversation. At the first stop, Rose Harrington climbs aboard and calls out to the fellow rider she sees every day at this time when she heads home from her job as an early morning hotel supervisor. Harrington wants to make sure everyone on the bus knows that there’s an event in Raleigh during the upcoming weekend that likely will detour some of the bus routes. Her fellow riders appreciate her thoughtfulness. Unsure of where to exit when the bus arrives on the side of Avent Ferry Road opposite of where they embarked, the women get procedural advice from the upbeat Harrington. “Wait until we cross Western Boulevard and then pull the cord,” she says. “What cord?” one of the women asks. Cord pulled, bus stopped, the women alight onto the sidewalk and stand together, agreeing happily that their transit excursion was something they hope to repeat. “I can’t wait to figure out all the ways I can use the bus to get downtown,” says Marlene Wilson, the league’s policy coordinator. Giordano also plans to try to map some transit routes to get to the places she frequents.